I've found that one of the most useful aspects of this web site is the suggestions that people make about coping with coccydynia, and one that has been very beneficial for me is sitting on ice-packs, both when driving and sitting at home. 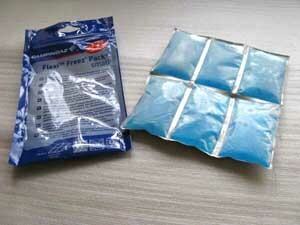 The ice packs I use are produced by Camping Gaz, and are flexible. They cost about £1.50 currently. One pack under each cheek, wrapped in a towel, will take about an hour to defrost. It can be uncomfortable to sit on initially, while it is frozen solid, but as it melts, it moulds to your shape. The numbness helps to deal with the pain. I put the packs on top of the coccyx cushion that I use. Do make sure you use a towel or something similar, as after repeated use, the packs can start to leak. In order to extend the range or distance that can be covered whilst driving, I have recently bought a 12v cool-box which I can plug into the socket in the car, and keep some spare ice-packs chilled. I can then change over once the initial ones have de-frosted. I hope this information will be useful to you, and that you will get some relief.